Maybe your ride takes you out to dirt roads in the country side and that is where the Kroemer comes into its own. Capable city riding bike that can take on the dirt roads outside of town makes this a very versatile bike. The 24 speed gearing should help in any situation you find yourself in. Like the city bikes it has a handle bar remote to change through the 5 levels of assistance while on the move. The Kroemer is a very competent urban e-bike that can take all the knocks the road can throw at it. Escaping out of town is when it comes into its own. The suspension, large range of gears and powerful hydraulic brakes all work in conjunction to put the power to the ground through those knobby tyres. This bike is happy on the tar as much as on the gravel. One of the best attributes of having a rear hub motor is the fact that all the power is delivered direct to the wheel. There is no loss of power through the chain or the torque setting in the motor that you have with a mid motor. This direct power works well on gravel roads as it does on paved roads. Combined with 5 assistance modes this bike can handle everything. For more detailed information, please download the Kroemer manual. How fast and how far can the Kroemer go? 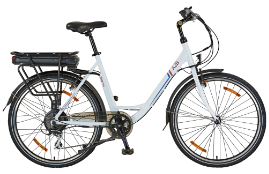 The Kroemer can reach speed of up to 18.7mph (30.2 km/h) worldwide and in Europe 15.5 mph (25 km/h), however you can pedal faster. The Kroemer will assist you up to 40 miles (64 kms) (the distance varies depending on the weight of the rider and riding conditions). How does the Kroemer handle hills? With the power from the rear hub motor combined with the correct selection of gear, you will find that the Kroemer will take on the hills without hassle. A ‘state-of-charge’ battery icon on the display highlights the level of charge. The indicator works like a fuel gauge on your car and will let you know when you are running low and should re-charge. Can I buy accessories for the Kroemer? The Kroemer has 5 levels of assistance to allow you to control the power. A full range of gears also allow you to set your cadence to the conditions or your preference. How do I charge the Kroemer? To recharge the battery simply plug the charger into any standard outlet and connect it to your portable battery (either on the bike or off the bike inside). To complete a full charge may take up to five hours depending on how discharged the battery is at the beginning of the charging process. For the best performance we recommend to charge your Kroemer battery at least every two months and if you are using it frequently try to use as much of the capacity before charging. The battery should be charged in temperatures greater than 10 degrees and not above 35 degrees. Our standard warranty covers you for: Five years on the e-bike’s frame. Two years on components and battery – covering all parts of your e-bike except brake pads, chain, freewheel and tyres. Normal wear and tear is not covered in warranty and neither is accident damage. The warranty terms mentioned above are applicable for European markets only and are different for other markets. Please see your local dealer for more information.